The bridge application has been implemented in Java and works. It has been tested in practice with the 'koppelting1' payload on 2017-8-26. This idea is about using TheThingsNetwork as a receiver for high-altitude balloon telemetry. TheThingsNetwork consists of a world-wide network of LoRaWAN receivers that can accept data from nodes to receive low-bitrate telemetry packets and forward them on the internet. It uses LoRa as a modulation scheme which allows for very small transmission power and is much less susceptible to slight tuning errors than the currently used RTTY modulation. This means that telemetry packets can be received completely autonomously by TTN gateways, no need for a radio operator to make adjustments etc. the habitat.habhub.org server still sees the same messages like it would if there were many traditional receivers, so doesn't need any modification! This way, the entire things network can be used to receive balloon telemetry! There is no longer a need for radio operators to be present at their receiver at the exact time the balloon is launched, making manual adjustments, etc. 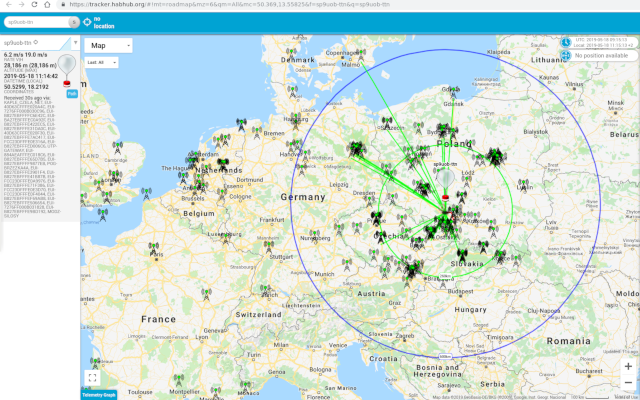 The Netherlands is already covered by many TTN gateways, greatly increasing the chance the balloon telemetry will be picked up. The README explains the tool chain setup. Using this source code, the basic functionality works. There is no user guide yet, but the .properties settings file has a one-line comment explaining what each setting does. The software consists of the following modules. Implemented using the Eclipse paho MQTT client. We can listen on a certain application and catch *all* traffic for all nodes registered to that application. The habitat interface is accessed as a REST service, using a combination of Jetty/Jersey/Jackson Java libraries. the <doc_id> is created from the telemetry sentence by doing ASCII to BASE64 conversion, then hashing using SHA-256 and encoding as ASCII-hex (as LOWER case!). "_raw": "[base64 of telemetry sentence]"
The "[receiver_id]" part can be repeated as many times as there are gateways that received the data. Eh, no, this results in a 500 internal error from habitat! a GET is done on http://habitat.habhub.org/_uuids?count=100, this returns a list of 100 UUIDs, where a UUID is the lower-case ascii hex representation of 16 bytes. This is implemented with an expiring cache, so listener information/telemetry is uploaded regularly (say every 20 minutes) but not with *every* payload telemetry. This part decodes the binary payload received from the TTN into a standard habitat sentence. 'sodaqone': SodaqOne universal tracker conventions. See the table and example below to know which fields are required to construct the habitat ASCII sentence from the LoRa data payload sent by your tracker. The cache keeps track of when listener information / telemetry was sent last. This makes it possible to avoid sending the listener information / telemetry with each payload telemetry document, reducing the load on the server. when it has been more than X minutes ago that we sent listener information / telemetry for this listener, where X is typically 10 minutes or so. perhaps just make up your own, if you don't use an RN2483? I personally think the 'cayenne' payload format is very nice, because it's relatively flexible and is an actual standard. You need to put in at least the GPS coordinate in it. If you have it available, I would also put in the battery voltage and temperature in it. Go to the TTN console and create a new application, or select an existing application you want to add the device to. this means the "device address", "network key" and "application key"
This page was last modified on 13 November 2017, at 13:58.